Most people know that calcium nutrition is important to bone development and maintenance. 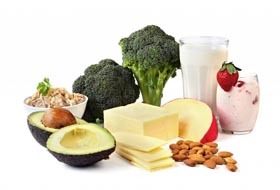 However, few are aware of the other health and nutritional benefits that calcium assists with, nor are they aware of the serious signs of a calcium deficiency. Learning what calcium is, how it works in the body and foods that can help avoid a calcium deficiency is important information for all, particularly with an interest in natural cures and home remedies. People over the age of 35 are at a heightened risk of deficiency primarily because there is a gradual reduction in the calcium found in bones after this age. This is particularly true for post-menopausal women who experience a loss of estrogen and a decreased capacity to absorb calcium in the intestines. Hormone replacement therapy may also prevent adequate absorption in women. It should be noted that, in serious cases of a deficiency, increasing intake with synthetic supplements may be recommended. However, most supplements only contain small amounts of the mineral and one should be very careful about relying on them as a sole source. Also, many rely on the calcium supplied by dolomite, oyster shells or bone meal, but each of these may also contain high levels of lead and other substances known to be toxic to the body. To assure that an adequate amount is being ingested and absorbed, always check the labels on supplements, as well as seek to increase intake primarily through the calcium nutrition-rich foods named above. Calcium nutrition is important at any age. Although there is more of a risk of developing a deficiency in older generations, avoiding foods that are a threat to absorption, such as soft drinks, which are high in phosphorus, and maintaining a daily exercise regimen from a young age decreases the chance of developing a deficiency as the body ages. It is particularly important for young women to understand that healthy lifestyle choices made today will greatly reduce their risk of developing osteoporosis due to a calcium deficiency later in life.